Worry no more about losing your dream home to a nuclear holocaust. 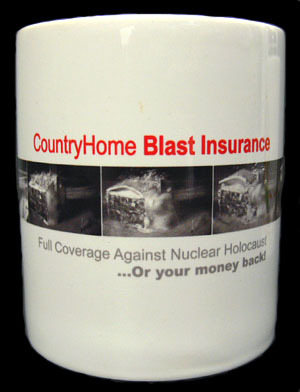 Country Home Blast Insurance is here! A great mug printed with the actual series of blast effect images from the Nevada Test Site. This was a big hit with our friends in the insurance industry. Like all our mugs, this one is printed in full color, on a high gloss, 12 ounce ceramic coffee mug. Dishwasher safe of course.